During race-based slavery in the United States, there were those who said that they believed that slavery should be abolished eventually (whatever that meant) but who refused to criticize the institution of slavery openly and call for its end, and, instead, campaigned for more “humane” slavery. And there were those who believed in abolition and would not endorse the system of slavery in any way. The former group criticized the latter group claiming that their refusal to jump on the regulationist bandwagon would only strengthen slavery. 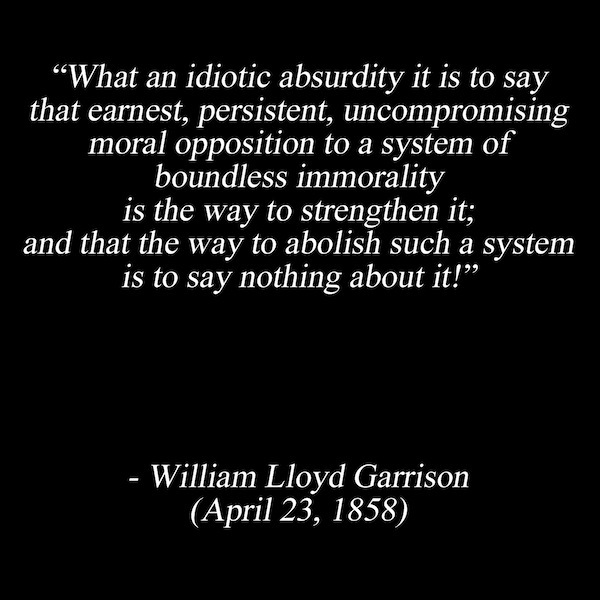 This quote from William Lloyd Garrison, an 19th-century abolitionist, is instructive. http://www.abolitionistapproach.com/wp-content/uploads/2015/09/aa_logo.png 0 0 Gary L. Francione http://www.abolitionistapproach.com/wp-content/uploads/2015/09/aa_logo.png Gary L. Francione2012-10-20 12:33:202012-11-20 14:09:43The Abolitionist-Regulationist Debate From Another Era: Sound Familiar?